On 6 October 1997, the Cassini space craft was launched to start its 7 year mission to Saturn. The drawing shows the path it is to take. It will reach Saturn on 25th June 2004 when rockets will be fired to put it in orbit around Titan, one of Saturn’s moons. From this orbit, Cassini will be able to transmit data about Saturn and Titan back to Earth. It will also be able to launch a moon-lander called Huygens. Huygens is fitted with penetrometers which produce electric signals when the moon lander hits Titan’s surface. Much will be learned of Titan’s surface by studying these signals. Your investigation is to experiment with a penetrometer by dropping one on a variety of surfaces. You are to produce a report which will help the scientists interpret the electric signals which will come from the penetrometers on Huygens when it lands on Titan. This will help them to describe Titan’s surface. Before starting your investigation, the UK Space Agency website contains some useful background information. When Huygens lands on Titan, a number of things will affect the penetrometer signal which is sent back to Earth. These include the speed of impact and the nature of the surface. You could investigate either of these factors. The UK Space Agency website gives more information on the project. There may also be books in the library and articles in newspapers and magazines. If you are studying the landing surfaces, you could start by listing all the possible surfaces which might be found on Titan. Next, you should list those you can investigate at school with the penetrometer provided. Unfortunately it must not be used with liquids. You might however use soft plasticine to represent mud. Certainly you should try a hard surface and also a soft one such as your mouse mat. If you are going to experiment with different gravels, you must decide how best to describe the size and shape of the individual stones. You must also make sure your tests are fair and are carried out safely and in a way which does not damage the equipment. You will also need to decide how many experiments you are going to do and how you are going to record your results. For example, you could save all the individual results on a hard disk or floppy disc to use later. Alternatively, you could just copy the graphs directly into a word-processed account. You will need to practise using the penetrometer first before recording any results. Care must be taken not to drop the penetrometer from too great a height because you could crack the ceramic sensor it contains and also because the software cannot record voltages higher than 5 V.
You may also have to share the apparatus with other students so make sure you are fully prepared when it comes to your turn to use it. If you have experimented with different surfaces, first try to explain why different patterns are produced when the penetrometer hits hard and soft surfaces. You should then explain why the pattern is so different when the penetrometer lands in gravel. Finally try to find the pattern which relates the shape of the graphs to the size of the pieces of gravel. You should comment here on how sure you are that the conclusions you have come to are reliable. You should also explain how useful you think penetrometers are for learning about distant surfaces and mention other things scientists might do to extend their knowledge of these surfaces. The penetrometer is connected via a DrDAQ interface to a PC computer. You are to drop the penetrometer onto a variety of surfaces and observe the patterns of the collisions on the computer screen. Connect the penetrometer to the DrDAQ (if not already connected). To do this connect the red wire to the screw terminal marked V (for volts) and the black wire to the screw terminal marked GND (for ground). 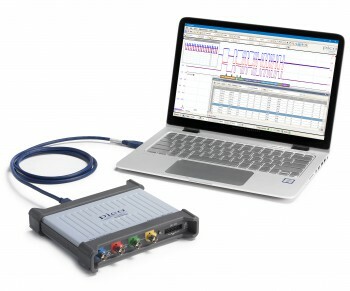 Switch on your computer, go to the Pico Technology program group and choose the PicoScope Oscilloscope Software. Change channel A from Sound to Volts. Change Trigger from None to Single. Click OK on the Warning which appears reminding you to press F9 should the screen freeze. Change the trigger signal from Sound to Volts. Again click OK on the Warning. Set the Percentage to -10%. This will move the starting point of the trace to the right. Click the space to the left of "Stopped". The sign GO should appear and Stopped will change to Running. You are now ready to experiment. As soon as the penetrometer hits a surface, a signal is triggered and a trace is displayed on the screen. If you want to keep the results, you can go to the File Menu and SAVE them under your own file name. Alternatively, go to the Edit Menu and COPY the graph into another package such as WORD. You need to reset the system to do another experiment. When the system is triggered, Running changes to Stopped. Click GO and Stopped changes to Running so you can do another experiment. You may prefer to spread the signal out more. This can be done by changing the Time Scale from 10 ms/div to 5 or 2 ms/div. Why do different surfaces produce different patterns? What is the difference between solid and loose surfaces? Try to predict what patterns you may get for new surfaces. Experiment with the penetrometer to verify your predictions. Pico Technology would like to thank Peter Chamberlain for submitting this experiment.